Ahead of the 2019 Lok Sabha election, technologically aware and social media savvy Prime Minister Narendra Modi is experimenting with a new way to zero in on candidates. On his personal 'NaMo' app, a survey called 'People's Pulse' is crowdsourcing data on a variety of factors: including the performance of BJP leaders. Modi urged his followers on Twitter on Monday to participate in the survey. "Your feedback on various issues will help us take important decisions," Modi said in a video message. BJP chief Amit Shah also tweeted about the survey, asking people to do their bit "towards a new India." The survey is a fresh attempt to gauge the performance of BJP MPs, rather different from the traditional methods used by the party in the past. One of the "important decisions" the BJP will make based on the results may be on the candidates for the upcoming general election. One can't help but wonder if Modi is taking his cues from Congress president Rahul Gandhi to hit upon a new method to select candidates. 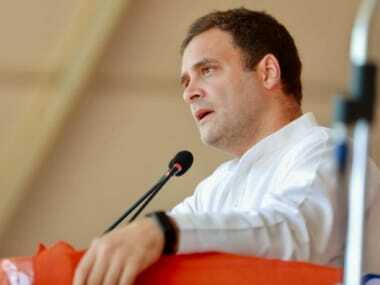 When Assembly elections were due in 2018 in Chhattisgarh, Rajasthan, and Madhya Pradesh, Rahul changed the selection process for candidates. Economic Times reported how the screening committees were made to travel to the respective states and obtain the information on the candidates from ground zero, before forwarding their names to the central election committee. This idea was reportedly suggested by the Chhattisgarh unit, so as to save time of the candidates who would camp in Delhi while the tickets would be finalised. 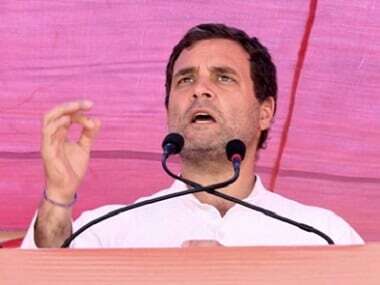 After the Congress emerged victorious in the three states, Rahul heavily banked on the party observers for the selection of chief ministers and ministers. The Telegraph reported that the Congress chief directed the observers to take recommendations from senior party leaders and MLAs. The survey on NaMo app gathers intelligence on similar lines as the Congress observers. The People's Pulse survey asks participants basic information about their state, constituency, their view on progress achieved by the central government in sectors such as affordable healthcare, prosperity of farmers, corruption-free governance, Swachh Bharat, national security, economy, infrastructure, employment and rural electrification. 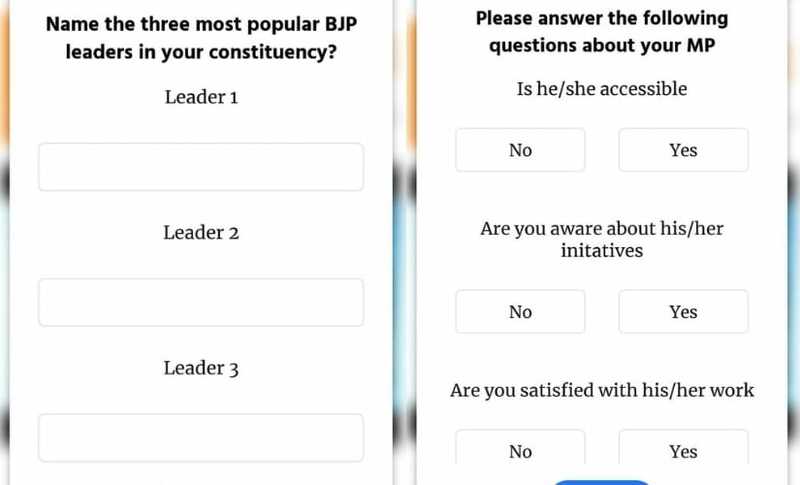 It requires the respondent to name the three most popular BJP leaders in their constituency, and also asks details related to the performance of the MP of the respondent's constituency. Screenshot of the People's Pulse survey. In various interactions with the BJP leaders and grassroot workers, Modi often stressed on the need to connect with the public and keep in touch with them. The survey is a smart way to ensure there is some interaction with the voters, while efficiently gathering data to improve BJP's decisions. In the past, the Modi government has used portals like MyGov to create awareness and gather feedback on its schemes and initiatives. However, this will be the first time the BJP will rely on crowdsourced information to shortlist popular leaders in each constituency. This move comes even as several MPs are dealing with the possibility of being axed in the upcoming election. 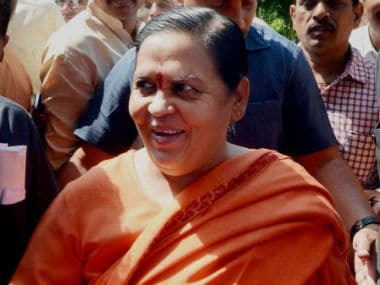 Recent reports suggested that the BJP might deny tickets to 57 sitting Lok Sabha MPs in Uttar Pradesh. 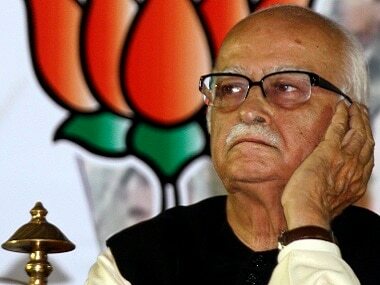 Reports emerged after an internal survey in at least 800 blocks of the state revealed that several party leaders had not adhered to Shah's directions of creating awareness about the party's initiatives. The survey said: "The farm loan waiver has failed to make any political impact as BJP leaders failed to make farmers realise that it was the Adityanath government that was instrumental in extending that sop. With the passage of time, the memory faded, and now farmers do not talk about this." With several Opposition parties also attempting to forge an anti-BJP alliance, the saffron party is clearly feeling the heat. "Do you see any impact of the proposed mahagathbandhan in your constituency?" asks one of the questions in the survey. While it may be too soon for respondents to answer, what remains to be seen is if the gathered information will actually amount to better decisions by the BJP.